Airborne Gummies as low as $5.99! 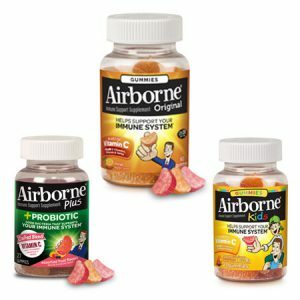 Airborne Immune Support Gummies – Available in Original Immune Support, Probiotics, and Kids Immune Support are deeply discounted. Order 6 or more (you can mix types) and you will get 50 cents off each unit ordered. Best by July 2019. Limit 18 Per Customer. Looks like a flat rate $1.49 shipping fee, no matter how many I put in the cart.